Henry Schein’s line of curettes and scalers features improved finger knurlings for enhanced tactile grip, which reduces hand fatigue. Maximizing the latest improvements in manufacturing technique (CNC Technology) and quality assurance (Rockwell Hardness Testing), these instruments are sharper, more precise, and longer lasting. The diverse product line features standard handles as well as lightweight, hollow ergonomic Maxima 9.5-mm diameter and DH#2 handle designs that effectively enhance all types of treatment. Henry Schein Dental is the exclusive distributor of Henry Schein brand products. I typically use my cavitron ultrasonic scaler first throughout the dentition then go back with hand scalers. 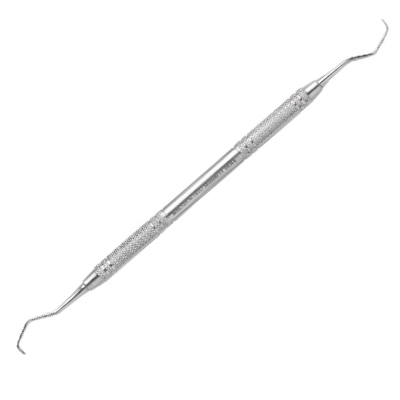 Henry Schein is an affordable company to buy scalers and other instruments. I use my anterior scaler on every patient that has anterior teeth. The grip makes a good firm hold and the thickness of the handle is good. Never had one break on me.